Sir Alex Ferguson OBE (born Alexander Chapman Ferguson December 31 , 1941 in Govan , Glasgow ) is a Scottish football manager and former player, currently managing Manchester United F.C. He has won more trophies than any other manager in the history of English football and been in charge of Manchester United for over 1,000 matches. He has previously managed East Stirlingshire and St Mirren , before a highly successful period as manager of Aberdeen . He was briefly the manager of Scotland , in a temporary capacity, owing to the death of Jock Stein , before becoming the manager of Manchester United . 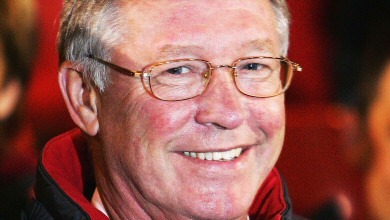 At Manchester United, Ferguson has become one of the most successful managers in the history of English football, having guided the team to eight league championships. In 1999, he became the first manager to lead an English team to the treble of league, FA Cup and European Cup. Some have critisied him,as personal rifts between him and some players always ended as the player being sold or released. (eg.David Beckham,Cantona,more recently,Roy Keane,all good players). He began as an amateur at Queen's Park , making his debut at 16 as a striker . He described his first match as a "nightmare"  but scored Queen's Park's goal in a 2-1 defeat against Stranraer . Although he scored 15 goals in his 31 games for Queen's Park, he could not command a regular place in the side and moved to St Johnstone in 1960. The following season (1964-65), Dunfermline were strong challengers for the Scottish League and reached the Scottish Cup Final, but Ferguson was dropped for the final after a poor performance in a league game against St Johnstone. Dunfermline lost the final 3-2 to Celtic, then failed to win the League by one point. The following October, Nottingham Forest wanted to sign Ferguson  , but his wife was not keen on moving to England at that time so he went to Falkirk instead. He was promoted to player-coach there, but when John Prentice became manager he removed Ferguson's coaching responsiblities. Ferguson responded by requesting a transfer and moved to Ayr United , where he finished his playing career.